Ninjago Fire Temple (Lego 2507) has been named best activity toy of the year. We're not surprised, we have it and it's very cool. Find out all about the Ninjago Fire Temple. 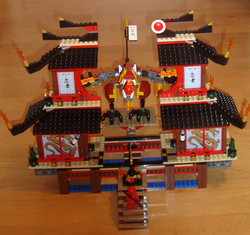 We've got quite a few Lego Ninjago sets, but the Ninjago Fire Temple is the biggest and best! It's no surprise to use that it's just won the Activity Toy of the Year Award at the American International Toy Fair. As the biggest set in the range so far, this is of course not the cheapest of toys. But you do get a lot for your money. 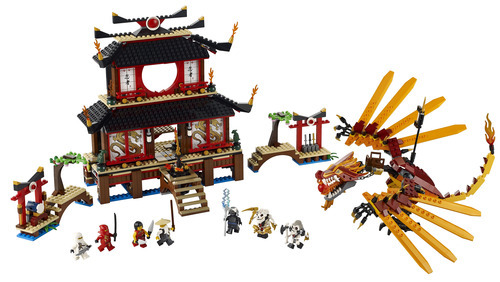 In this article we'll take a look at what's included in the Ninjago Fire Temple set, and the features it has to keep kids entertained long after they (or their parents) have built the model. If you didn't get the Fire Temple last year, it's definitely still worth buying it before it becomes hard to get hold of. If you have it already, then try the Ninjago Destiny's Bounty - the very cool ship in the Ninjago snakes theme. 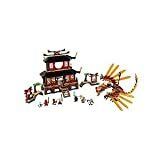 The Lego Ninjago Fire temple is a very large set! The Fire Temple itself is very big. And you also get two small shrines. There's also a big Fire Dragon and 7 minifigures with accessories. The set has 1174 Lego pieces in total - yes, that's a lot. The set is recommended for kids aged 8-14. But that really applies to building the model themselves. If a parent is willing to help with the build then younger kids will love it. In our house, my 3.5 year old built the minifigures. My 5 year old was able to help with a lot of the building, but it would have been too big for him to make on his own so his Dad did the majority. It took about 4.5 hours for an adult to build with some help from a five year old. It's Kai DX you get here with his dragon costume. It's a very nice printing and has detail and his name on the back of the minifigure. The dragon version of Kai makes sense here because the Fire Temple set includes the Fire Dragon. The Fire Dragon allows Kai to ride him after some initial disagreement over the golden weapons! Lord Garmadon is my boys' favorite bad guy. I think the Samukai minifigure is amazing, especially from the back. See the shrine below for pictures. This set includes Kai's dragon, the Fire Dragon. The Fire Dragon is much better than I thought it would be. The yellow feathers on the wings work really well and he can shoot a fire ball from his mouth - it goes a long way! The dragon has a seat on the top where Kai can sit. The wings move up and down and the legs can move too. The two shrines included with the NInjago temple are nice additions to the set. If you're buying the set for younger kids then they will be able to build the shrines (if you sort the pieces for them) while you build the temple and dragon. I really like the pink cherry blossom on the trees - a very nice Japanese touch. And the shrines are different. One has a drum while the other has a set of daggers. Picture: One of the shrines with the 3 evil minifigures included in the set. The Fire Temple itself is very cool. It's packed with small details like mini dragon statues and the gorgeous dragon design on the screen windows. The red and black colors are very striking and make for a very effective Japanese temple. There are lots of gold details too, and lots of fire - this is the Fire Temple after all. The dragon sits on a platform behind the temple looking through the window. When you pull up the sword at the front on the temple it splits in two, releasing the dragon. This works very well - the action is smooth and if you push the two sides back into place at the same time, it easily clicks back together. The inside of the temple also has lots of detail. If you turn the temple round then you've got a good building that you can play with minifigures inside. Our Ninjago Fire Temple viewed from the back. You've got space to play with minifigures inside and you can see the platform where the Fire Dragon stands. We love this toy. It looks amazing, I love all the Japanese details. There's a lot of play value in this toy because the temple opens up and because the back of the temple is open (dollhouse style) and you get lots of minifigures. And the dragon is another toy in its own right and works really well with the temple. I can't resist setting up the dragon and triggering the opening mechanism! My five year old can easily operate the opening mechanism - it's very well designed. You need to push both sides back at the same to close it, he can do this easily. Older kids will be fine with the Fire Temple. The black roof pieces and their fire torches can get knocked off but are easy to put back on. The rest of the set stays together pretty well and can definitely be played with by the recommended age group 8-14. Summary: This is an expensive Lego set, but there is a lot here. It's a great model to build and there's lots to play with. If you want a similar toy for younger kids (perhaps to keep a younger child away from their big brother's Fire Temple) then try the Imaginext Samurai Castle. The Imaginext Samurai and Ninja range of toys is one of the latest editions to the range. Contract the Samurai battle combat with the more subtle Ninja style. The Fire Temple has a lot of stuff in one set and there's plenty of play value here. The set is packed with interesting bricks too so kids will have fun making other things from them in future. The Lego Store often have free gifts, exclusive Lego sets and offers on Lego sets, so it's worth checking out the current price of the Fire Temple at the Lego Store. 2012 is an amazing year for Lego. We've got the Ninjago Snakes theme, Lord of the Rings and the Hobbit Lego, a Lego Star Wars Game, Lego Friends and lots more. There's a range of Lego Ninjago watches that come with ninja or skeleton minifgures. A Ninjago watch makes a great gift for a Ninjago fan. Looking for a gift for a child who loves Lego Ninjago? There are a few different Ninjago key rings and keychain lights available which kids will enjoy. Did you like the Ninjago Fire Temple?